First sentence: One day while Julie was visiting her grandparents, her grandfather said, "Did I ever tell you about my good friend Moishe?" This a cute story about a grandfather's tall tales of the family's immigration from Russia to America. 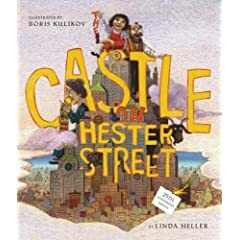 By countering grandpa's stories of castles and moons made of matzoh, with grandma's explanations of how things really were, Linda Heller has created a gem of a book in teaching kids about the experience of immigration. It's an endearing story that all ages could enjoy.